HomeAutomating the business intelligence process? Automating the business intelligence process? I enjoy reading the thoughts of vastly experienced industry analyst Merv Adrian on his blog, Market Strategies for IT Suppliers, and also on twitter via @merv. Merv covers industry trends and a wide variety of emerging and established technologies and companies. I would encourage you to subscribe to his RSS feed. In a recent artcile, Balanced Insight – Automating BI Design to Deployment, Merv reviews the Consensus tool and approach developed by Ohio-based outfit Balanced Insight. I suggest that you read Merv’s thoughts first as I won’t unnecessarily repeat a lot of what he says here. His article also has links to a couple of presentations featuring the use of Consensus to build both Cognos 8 and Proclarity prototypes, which are interesting viewing. Disclaimer: I haven’t been the beneficiary of a briefing from Balanced Insight, and so my thoughts are based solely on watching their demos, some information from their site and – of course – Merv’s helpful article. Promising to “deliver in half the time without compromising cross project alignment” is a major claim and something that I will try to pay close attention to later. I agree with Balanced Insight’s recommendation, but rather take issue with the assumption that IT always starts by looking exclusively at data when asked to partake in information-based initiatives. I have outlined what I see as the four main pillars of a business intelligence project at many places on this blog, most recently in the middle of my piece on Business Intelligence Competency Centres. While of course it is imperative to understand the available data (what would be the alternative? ), the first step in any BI project is to understand the business issues and, in particular, the questions that the business wants an answer to. If you search the web for BI case studies or methodologies, I can’t imagine many of these suggesting anything other than Balanced Insight’s recommended approach. Moving on, the next stage of both the demos introduces the company’s “information packages”. These are panes holding business entities and have two parts; the upper half contains “Topics and Categories” (things such as date or product), the bottom half contains measurements. The “Topics and Categories” can be organised into hierarchies, for example: day is within week, which is within month, quarter and year. At this point most BI professionals will realise that “Topics and Categories” are what we all call “Dimensions” – but maybe Balanced Insight have a point picking a less technical-sounding name. So what the “information package” consists of is a list of measures and dimensions pertaining to a particular subject area – it is essentially a loose specification for a data mart. The interesting point is what happens next, the Consensus Integrator uses the “information package” to generate what the vendor claims is an optimised star-schema database (in a variety of databases). It then creates a pre-built prototype that references the schema; this can be in a selection of different BI tools. From what I can tell from the demos, the second stage appears to consist of creating an XML file that is then read by the BI tool. In the first example, the “Topics and Categories” become dimensions in Cognos AnalysisStudio and the measures remain measures. In both demos sample data is initially used, but in the ProClarity one a version with full data is also shown – it is unclear whether this was populated via Consensus or not. The “information package” can also be exported to data modelling tools such as ERwin. One of the Balanced Insight presentations then mentions that “all that’s left to do is then to develop your ETL”. I appreciate that it is difficult to go into everything in detail in a short presentation, but this does rather seem to be glossing over a major area, indeed one of my four pillars of BI projects referred to above. Such rather off-hand comments do not exactly engender confidence. If there is a better story to tell here, then Balanced Insight’s presentations should try to tell it. There are a few ideas operating here. First that Balanced Insight’s tools can support a process which will promote best practice in defining and documenting the requirements of a BI project and allow a strong degree of user interaction. Second that the same tools can quickly and easily produce functioning prototypes that can be used to refine these same requirements and also make discussions with business stakeholders more concrete. Finally that the prototypes can employ a variety of database and BI tools – so maybe you prototype on a cheap / free database and BI tool, then implement on a more expensive, and industrial strength, combination later. Balanced Insight suggest that their product helps to address “the communication gap between IT and the business”. I think it is interesting using the “information package” as a document repository, which may be helpful at other stages of the project. But there are other ways of achieving this as well. How business friendly these are probably depends on how the BI team set them up. I have seen Excel and small Access databases work well without even buying a specific tool. Also I think that if a BI team needs a tool to ensure it sticks to a good process, then there is probably a bigger problem to worry about. Of course, the production of regular prototypes is a key technique to employ in any BI project and it seems that Balanced Insight may be on to something here, particularly if the way that their “information package” presents subject areas makes it easier for the BI team and business people to discuss things. However, it is not that arduous to develop prototypes directly in most BI tools. To put this in a context drawn from my own experience, building Cognos cubes to illustrate the latest iteration of business requirement gathering was often a matter of minutes, compared to business analysts putting in many days of hard work before this stage. Having decided to use Consensus to capture information about measures and dimensions, the ability to then transfer these to a range of BI tools in interesting. This may offer the opportunity to change tools during the initial stages of the project and to try out different tools with the same schema and data to assess their effectiveness. This may also be something that is a useful tool when negotiating with BI vendors. However, again I am not sure exactly how big of a deal this is. I would be interested in better understanding how users have taken advantage of this feature. It would be easy to offer a couple of other criticisms of the approach laid out in the demos; namely that it seems to be targeted at developing point solutions rather than a pervasive BI architecture and that (presumably related to this) the examples shown are very basic. However, I’m willing to given them the benefit of the doubt, a sales pitch is probably not the place for a lengthy exploration of broad and complex issues. So I think my overall response to Balanced Insight’s Consensus product could be summed up as guardedly positive. I think I understand the single black arrow on the right of the diagram, I’m struggling to work out what Consensus offers (aside from documentation) for the two black arrows on the left hand side. 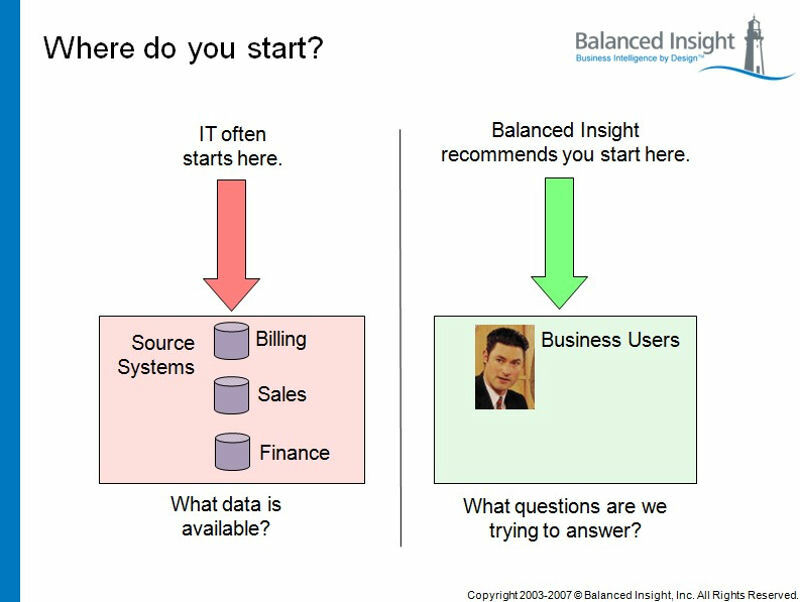 Despite the fact that Balanced Insight disparaged the approach of looking at available data in their presentation, there is no escaping the fact that some one will have to do this at some point. Connections will then have to be made between the available data and the business questions that need answering. In both demos Consensus is pre-populated with dimensions, measures and linkages of these to sample data. How this happens is not covered, but this is a key area for any BI project. Unless Balanced Insight have some deus ex machina that helps to cut the length of this stage, then I begin to become a little sceptical about their claim to halve the duration of BI work. Of course my concerns could be unfounded. It will be interesting to see how things develop for the company and whether their bold claims stand the test of time.